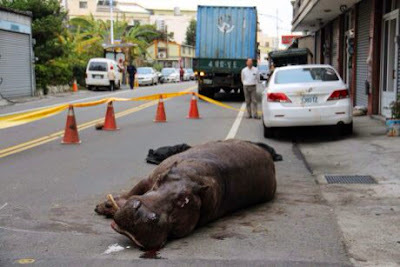 Last week, a hippo was injured (not killed) when it panicked and jumped through the window of a truck in which it was being transported. The animal is a star attraction at a farm in Taiwan, and the noise when it jumped from the vehicle, landed on a parked car, and fell to the ground drew attention. Crowds gathered and some confused residents reported to the authorities that a dinosaur was on the loose.